I was at school and beginning my forays into music collecting when people proclaimed vinyl was dead. Following the rise of digital music it is ironic that something once perceived as an anachronism, is now the only format that retains its physical value and appeal. For me a 12″ piece of vinyl is the best way to appreciate the accompanying album art as well and when an artist really steps up and creates a mouthwatering visual element to go hand in hand with the sonic delivery, it makes the overall experience somehow warmer and more personal and this split from Aussie label BroFidelity certainly delivers on the stunning cover, grabbing your attention from the get go. Opening the sleeve to reveal a tri-coloured disc was the point where my jaw hit the floor. Seriously, this is a thing of beauty and worth buying without even putting on a turntable… but I could talk about the presentation all day. Musically this is no slouch either; three great bands bound together on Bro-Fidelity Records by the common theme of the love of great spiritual rock music. First up WaterWays from the USA bring four tracks of dark surf rock that manages to be almost folky and bleak despite sounding sun drenched, light and airy, soaring and laid back. Of course the name WaterWays should be familiar to readers and the resume of the band members reads like a who’s who of the desert rock scene that gave birth to generator parties and of course, the mighty Kyuss. With long time friend Abby Travis as the vocal focus point, Stoner legend Gary Arce and long time friend Mario Lalli can showcase the musical symbiosis they have shown for over 25 years. Rounded out by Lalli’s Fatso Jetson brother Tony Tornay on drums, this band have pedigree that holds up to the standards set by the more famous Yawning Man. The similarities that will be drawn to Arce’s other band are inevitable, but WaterWays are a unique prospect in their own right and they go from strength to strength with each release. 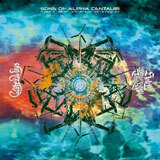 I was first made aware of second band Sons Of Alpha Centauri through their collaboration with Arce on the Yawning Sons album ‘Ceremony To The Sunset’ where the British Avant Garde rockers teamed with up the Desert Godfather to create 9 tracks of beautifully eclectic ambient music. Here the Sons appear in their own guise with the nine minute epic ’27’. Apparently thought too long to feature on their 2007 self titled debut, this rare track has been dusted down and finally set free into the world. As you would expect from the genre defying instrumental rock pioneers this is a compelling, complex and lavish piece of music. The peaceful, introspective beginning gently builds in momentum as the track grows and grows until it breaks out into a chugging rocker that speaks to you through spacey accented guitar parts. The fact that it flies past is tribute to how adept the Sons are at crafting incredibly listenable music. Then final band are Australia’s Hotel Wrecking City Traders, a duo consisting of brothers Ben and Toby Wrecker who carve out ‘heavy noise explorations’. Their contributions to the split is the ten minute fuzz overdrive of ‘Palmo Victus’ that recalls the thunderous instrumentals of Karma To Burn with equal amounts of laid back cool and smoked out twists and turns. This tripped out piece is hypnotic and almost dirge like, as the simple single guitar playing against the tribal-lite drums. Clearly designed to explore altered mood states, the track is chilled and meandering, more concerned with the journey than the destination. Also exclusively appearing on this release, what Hotel Wrecking City Traders bring to the mix feels slightly understated, but is no less important to the mood and feel of the record as it washes over you and leaves little hooks in your psyche. As you may sense I am in love with this split! What BroFidelity have done is pull together three bands who are not only awesome in their own right, but complement each other fantastically and have wrapped it up in frankly the best packaging I have seen by a band not called Iron Maiden.